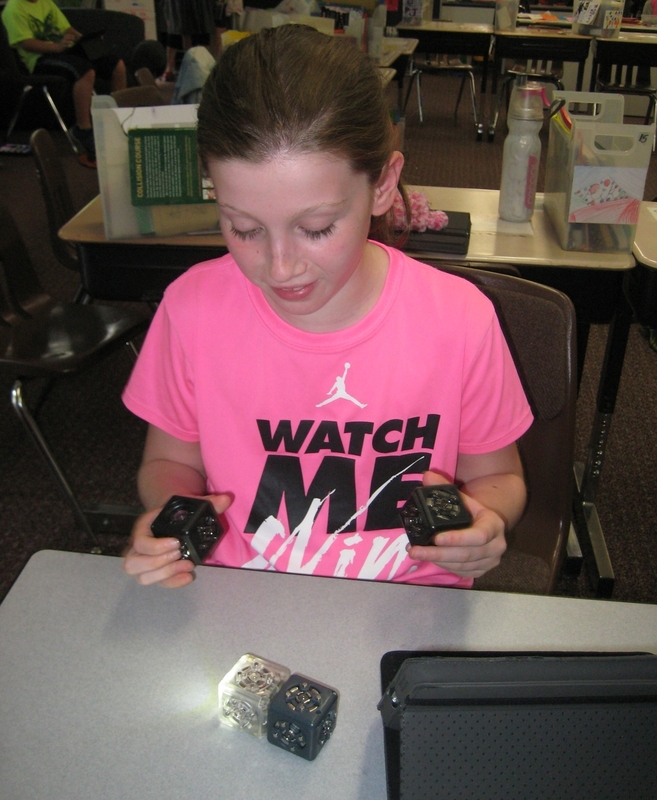 Our last experiment of the year centered around Cubelets. Cubelets are a set of blocks that come with a selection of "Sense", "Action" and "Think" blocks. The blocks can be assembled in a variety of ways to make simple robots. We were interested in working with Cubelets with the third graders since they are hands-on, incredibly engaging, and also required logical and sequential construction. We worked with the Cubelets over three lessons. We wanted to allow the students to determine what each block did on their own. The first day we put the students into teams of four, gave them a basic Cubelet starter set of six-blocks and had them determine the blocks' purpose. As they came to a group agreement, they labeled a picture of the basic set in keynote. It was immediately apparent that the students had a difficult time with the novelty of the materials. They were interested in putting every block together and seeing it work instead of isolating each block's potential. There was a lot of guidance around simplifying the chain of blocks to truly determine a block's potential. The second lesson with Cubelets began with a review of the basic blocks' purpose. Each group then was tasked with making and videoing a "Spinbot" and a "Straightbot" that could be controlled with their hands. As an added contraint, they needed to use one specific block in both of their bots. Finally, they were given four new blocks to explore and label. The third lesson asked the students to determine how to use the Cubelets to make a robot that could be useful. The third graders started with an initial sketch of their thinking indicating which blocks they would need to use. After the build, we shared the Cubelet designs with the class. A final reflection involved a look at real life application for their designs, how they worked in a group, and a map of highs and lows of the Cubelet experience.